Even if you have been a long-time golfer for decades or for only a few months, you understand that every sport has intermittent setbacks. Sometimes, it can be quite discouraging, especially if you don’t have the training aids to help your golf game. If this describes you, then you should be anxious to move past this issue, working to get your golf game back on track. Golf training aids can provide the help you need to improve your game. If your game on the green has not been successful lately, it is time that you try to identify the problem first and foremost. Once you have found the problem, it is time to initiate a plan of action. If you are suspicious that struggles with your golf game is tied to inconsistencies with how you may hit the ball, then there is help from the Rope It Golf Training balls. You can use this device to practice your golf swing in the comfort of your back yard. More importantly, you don’t have to worry about hitting the ball and not finding it or having it go out on the street in oncoming traffic. The golf ball fits to a rope and can be used in a controlled setting. 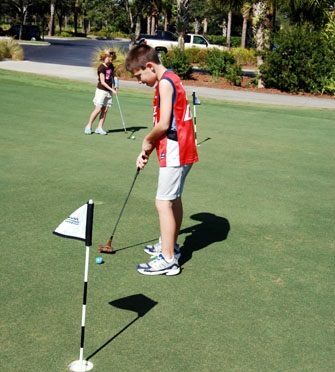 After using the Rope It Golf Training balls to practice in your backyard, you will definitely notice how accurate your golf swing is going to be. The effort will be worth your time because practice makes perfect. Alignment is essential to your golf game struggles The Rope It Golf Training balls are ideal for getting your alignment in order. These training aids will mirror the appropriate alignment, giving you a golf game that you have never had before. Moreover, it is portable and so you can take it everywhere you go: to the golf course, while traveling, to your golf buddies backyard and just about anywhere – even the park. You can pack it in with your other golf equipment and use it as a warm up device before playing your actual golf game. The Rope It Golf Training balls are essential in helping you to correct your posture, therefore, ultimately helping with your alignment. Soon you will be playing like a professional golfer. It will help you perfect your technique and fix your mechanics while you are playing the game of golf. You don’t need a golf trainer when you have the Rope It Golf Training balls nor do you have to take golf lessons. To be the best golfer you can be, you need to invest in the most efficient golf training aids. Rope It Golf Training balls will help you to take full advantage of your potential. To learn more about the Rope It Golf Training balls, CLICK HERE!